Numerical models are constantly changing. Learners need a solid understanding of the basic building blocks of model systems, such as dynamics, physics, and assimilation. This course will enable learners to adapt to future model changes and use model guidance intelligently when forecasting the weather. The lessons in this course were created in collaboration with the Australian Bureau of Meteorology and include Southern and Northern Hemisphere examples. In addition to Australian meteorologists, forecasters around the world will benefit from the availability of these materials. Describe the difference between how a grid point model and a spectral model represent data. Describe the difference between how a grid point model and a spectral model lose information about unresolved features. Describe the goal of data assimilation (DA), and why a model might produce a better forecast if its analysis does not fit a perfect observation too closely. Identify at least one consequence of errors in model physics on model forecasts at and around a forecast location. Describe how the model prediction of boundary layer evolution can be affected by vertical resolution in an area of complex terrain. It is recommended that those new to weather forecasting go through the lessons in order. 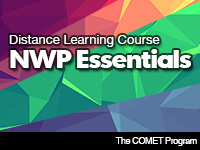 Those with some experience can go directly to the NWP topic of greatest interest to them. To receive a course completion certificate, you must successfully complete all five lessons which will take about 7.5 hours.